As promised, here’s a recipe that uses kimchi and I hope you’ll love it as much as I did! It’s Asian-inspired, low-fat, vegan and made gluten-free without complicated substitutions. Best of all, it’s easy! The week before last, we had the worst winter weather of the year here. Because we live in the South (where we can count the days of snow, sleet and ice on one hand), the homes here are not well insulated–at least ours isn’t. I could not get warm ALL DAY no matter how many layers I put on and no matter how long I stood at the gas fireplace. It was just a bone-chilling, cold day that called for soup. I had the idea for this Asian vegetable soup recipe in my head and although we already had plenty of different soups in the freezer, I needed to have one simmering on the stovetop instead of trying to thaw out a frozen brick. And you already know there’s something about soup simmering on the stovetop rather than being thawed out in the microwave that makes everything in your world all better! I was craving Asian and needed something spicy that I could dive into and inhale to warm me from the inside out. 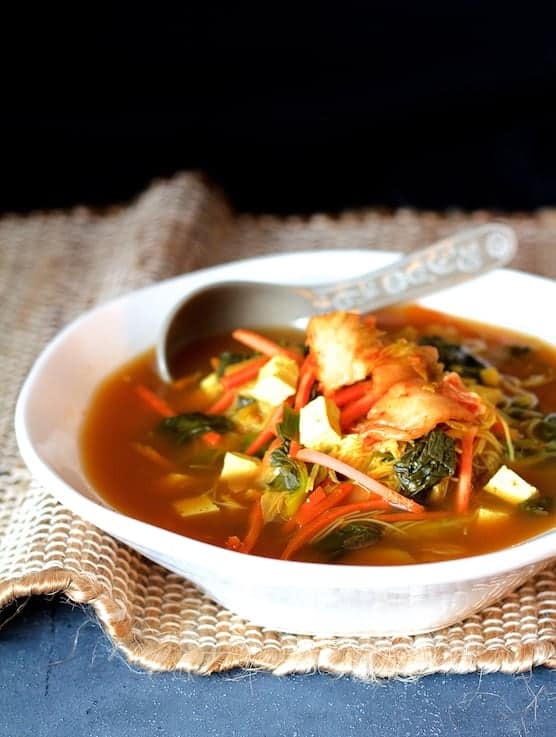 This Asian vegetable soup was absolute perfection! So how is this for easy? Combine the broth, seasoning and most of the vegetables in a pot, simmer until tender, then stir in the scallions, tofu, rice noodles and kimchi. Simmer a tad more. Done! You don’t even need to squeeze a lot of the water out of the tofu because it will be going right back into a liquid; just dab it dry with a paper towel. Combine the broth, seasoning and most of the vegetables in a pot then simmer until the vegetables are tender. Stir in the scallions, tofu, rice noodles and kimchi. Simmer a tad more. Done! You don’t even need to squeeze a lot of the water out of the tofu because it will be going right back into a liquid; just dab it dry with a paper towel. This healthful and flavorful soup is guaranteed to warm you from the inside out! Combine the broth, soy sauce or tamari, curry powder, ginger, garlic, carrots and bok choy in a large pot. Bring to a boil, cover slightly and simmer until vegetables are just tender, about 8-10 minutes. Add scallion, tofu, brown rice noodles and kimchi. Bring back to a simmer and cook another 2-3 minutes or until rice noodles are soft. This looks amazing, but where do you get vegan kimchi? What brand do you use? 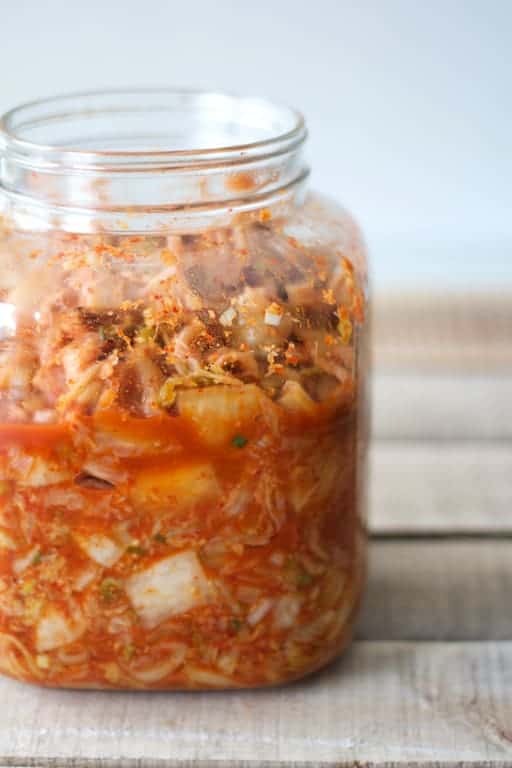 Kimchi traditionally has at least anchovies and usually shrimp or beef extract. I live near the Korean district in my town and I have yet to find a vegetarian brand of kimchi. Good point. You would probably have to make it yourself. It’s possible Whole Foods would have vegan kimchi. 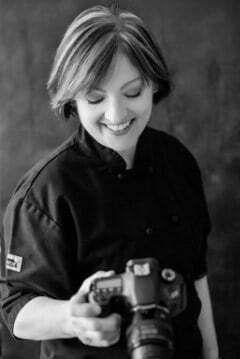 Here’s the recipe I use from the Green Kitchen app however it contains honey: http://www.fromachefskitchen.com/homemade-kimchi/ Agave might work. If you do a Google search, a number of vegan kimchi recipes come up. It’s a fun project to do at home. Hope you all enjoy! I loved this soup….I ate the whole pot myself! Oooh…..did I just admit that? I feel like I just died and went to Heaven looking at this soup. I am always looking for Asian inspired vegan recipes because I love the spices and flavors. This looks incredibly healthy, comforting and delicious! This is a gorgeous soup! We’ve been having horribly cold weather here in Canada as well. Spring is teasing up though, so fingers crossed, LOL. Totally lush flavours hear and so healthy too – love it! easy and incredibly delicious looking!